What does it feel like to you, to be told your an introvert? Just because you like to spend time alone doesn’t mean you are idiosyncratic. Perhaps as a kid, when told you were loner that word made you feel like some sort of out-cast or freak. Growing up with a deep inner knowing that there might be a little something different about yourself from the rest of the tribe, wasn’t always a bowl of cherries. Humans who have outlandish ways of getting on in this world are not particularly appreciated for who they are authentically, they can be so grossly misunderstood. There is nothing more saddening than to see an extraordinary person shut themselves off because they simply just don’t know how to be different. It isn’t easy to be odd in a world that doesn’t necessarily accept anything out of what is considered ‘societal normal’. What is normal anyway, it is so overrated, outdated and redundant!! I honestly think that word should be taken out of the dictionary and banned from being used. Why not, there are bizarre and crazy rules for just about everything else under the sun. The word normal is a definition, just the sound of it can make you feel like you are being judged. ‘Act normal’, I used to hear that a lot. I never questioned my parents when I was younger, but I so badly wanted to ask my Mom what she really meant by those words anyway. I didn’t see her acting, what I thought was normal sometimes, life as a kid can be so confusing. 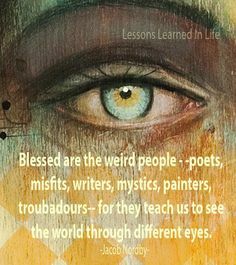 I suppose my sentiments today are really quite simple, if you feel in anyway that you are a little bit not normal, I applaud you, congratulations because instead of just being plain boring ordinary, you are a beautiful, eccentric weirdo. Never mind from now on what other people say or think about your peculiarness, it doesn’t matter what anyone else’s opinions are. Weirdo is the new introvert, rejoice in who you came to be in this life experience. Embrace all of what makes you real and honest. Accept and appreciate that the beat of your drum, is a little offbeat!